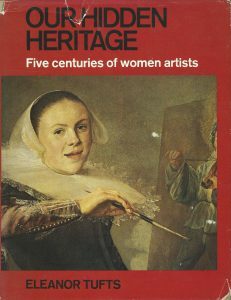 I first came across the Italian artist, Artemisia Gentileschi (1597-1652), in Our Hidden Heritage by Eleanor Tofts, published in 1974. It was one of those books at the forefront of the Women’s Liberation Movement of the 1970s which sought to re-instate women writers, artists and composers whose works had been forgotten or downgraded. 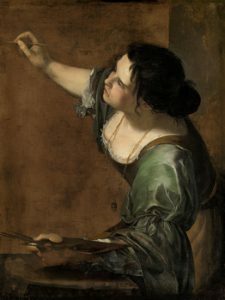 Artemisia was taught to paint by her father, Orazio Gentileschi, in Rome. Both were influenced by the new style of the painter, Caravaggio, with its accentuated use of shadows, strong colours and dramatic story-telling. Artemisia became known for her wit and high-spirits, as well as her painting. But, when she was only seventeen, her life took a traumatic turn. She was raped by a friend of her father’s, a fellow painter called Agostino Tasso. Orazio appealed to the Pope and Agostino was brought to trial. Artemisia was cross-questioned under torture but held firm, and Tasso was imprisoned for eight months. Poor Artemisia was hastily married off and moved to Florence. In Florence, she rapidly became a successful painter and, aged only twenty-three, was made a member of the Academy, an unusual honour for a woman. Her patrons included the Barberini family in Rome, the Grand Duke of Tuscany, the Spanish Duke of Alcalà, and, later, King Charles I of England. Among her paintings are several depicting the gruesome Old Testament story of Judith and Holofernes. In it, the Jewish heroine, Judith, engineers a meeting with the invading Assyrian general, Holofernes, and cuts off his head. In the version, now in the Pitti Palace, Florence, Judith has seized Holofernes’ sword and is plunging it into his neck with such force that blood is spurting everywhere. The look on Judith’s face is one of intense frowning concentration. We see her well-muscled arms as one hand grabs him by the ear, and the other saws at his neck. In the background, her maid holds him down. We can see what she got from Caravaggio: the shadows, the bold use of colour and the dramatic story-telling; but the strong emotion is, surely, her own. It’s impossible not to ask whether there is a psychological component to her interest in this bloody theme. We know that when Tasso raped her, Artemisia fought back and wounded him several times. Is she using her portrayal of Judith to relive that trauma and do to Holofernes what she wanted to do to Tasso, but could not? The painting certainly packs a powerful punch. Or does it? 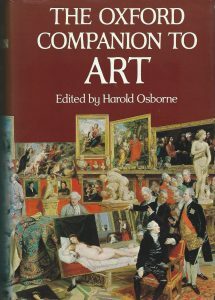 Let us look at what the Oxford Companion to Art, edited by Harold Osborne and published in 1970, has to say about Artemisia. Note that this book was published before Eleanor Tofts’ reassessment of female artists. Orazio Gentileschi’s entry is twenty-four lines. Artemisia’s, however, is a mere sub-entry to her father’s and covers only twelve lines. Her work is damned with faint praise. It says, ‘She was instrumental in popularizing a romanticized type of Caravaggism,’ (Ouch!) and ‘her blood-thirsty scenes (of Judith and Holofernes) are painted in disarmingly bright, clear colours,’ which, in my view infantilizes her work. One wonders how he explained her being made a member of the Academy in Florence at twenty-three. In 1638, Artemisia was invited to London by King Charles I. It was here that she painted the fine self-portrait, called La Pittura, now in the Royal Collection. Indeed, at this very moment, it is one of the stars of the exhibition Portrait of the Artist which is on at the Queen’s Gallery. In La Pittura, Artemisia has dared to take the standard emblematic handbook of the time, the Iconologia of Cesare Ripa, which itemizes Classical symbolism, including the iconography of Painting (La Pittura), and apply it to herself. Ripa describes the personification of Painting as a beautiful, dark-haired woman with dishevelled tresses, perhaps reflecting the untamed emotion which fuels artistic creation. She wears a gold chain around her neck from which hangs the image of a mask, symbolizing that painters imitate reality. Her arched eyebrows indicate reflective thought. Artemisia’s left hand holds her palette and her elbow leans on her grinding stone – like all artists at the time, she grinds her own paints, which was hard work. Her right hand holds her brush and her sleeve is pushed up out of the way, showing her well-muscled arms. Again, we can see her absorbed concentration, as in her Judith and Holofernes picture. She wears a brown apron over her lush green silk dress and there is no doubt that she is female; her low cut neckline shows the swell of her breasts, and the gold chain emphasizes both her figure and that she is a successful artist – a professional. She is saying, in effect, ‘I am “La Pittura”’, she is truly the embodiment of the art of painting, which is something no man can claim. The other thing I really love about this picture is that, unlike most of the self-portraits in the Queen’s Gallery exhibition, Artemisia is not interested in the viewer – even if he had commissioned it. Charles I may not have been a good king, but he certainly had an excellent eye for art! 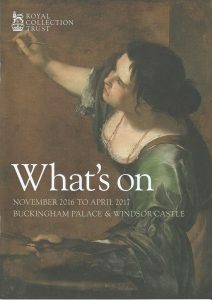 Brochure for What’s on November 2016 to April 2017, The Queen’s Gallery and Buckingham Palace. It is interesting that, while Artemisia’s splendid portrait remains the same, the critics’ views about it have changed radically since 1970. Or, perhaps one should say that critical thinking about Artemisia Gentileschi has returned to what it was during her lifetime. ‘La Pittura’ is in the exhibition Portrait of the Artist at the Queen’s Gallery until 17th April, 2017, and you can make up your own minds. I really enjoyed the exhibition. Furthermore, if you get your ticket stamped after your visit, you can use it for a whole year. Fascinating as always, and new to me. I had not heard of her though I’ve seen that painting in the Pitti. Didn’t remember it but it rings a bell now I see it here. 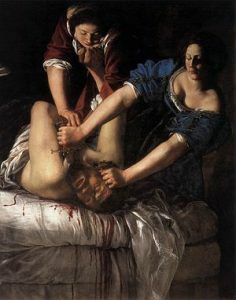 The Judith and Holofernes was a popular theme. There’s that incredible sculpture of same, of which a copy stands outside the main art gallery of Florence (forget the name for the minute). Original inside is much smaller but very detailed. I love Caravaggio and one can certainly see the influence in Artemesia’s paintings. Thank you for your comment, Elizabeth. What I love about Artemisia is how gutsy she was. And I love that self-portrait, the way her right arm is curved round and her left arm sort of continues the circle in the other direction, it’s as if she’s enclosing the space and making it hers. Actually, her life – she had lots of lovers – would make a wonderful basis for a novel. Thank you, Ann, for your comment. I’m so glad you enjoyed my post – and the exhibition, too. Yes, I remember the TV programme – she certainly had an interesting life!